If you're in Melbourne, find out when your tram is coming via your iPhone or Android device. 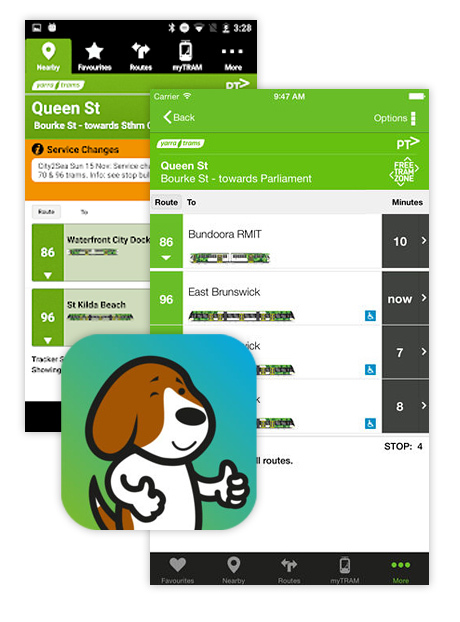 tramTRACKER® provides digital passenger information including predicted tram arrival times, disruption updates, and information about Melbourne's tram network. Some features on tramTRACKER® requires you to know the Tracker Stop ID. It is a four digit number that is displayed on a green sticker at the tram stop. You can also find it by phoning 1800 800 007 and stating the location of the tram stop and the direction in which you wish to travel. You can use tramTRACKER® online at tramtracker.com. Every tram stop across our network has a unique ID number. The Tracker Stop ID is located with the scheduled timetables information at your stop. If you already know your Tracker Stop ID, enter the number to show when the next three trams are due to arrive at your nominated stop. If you want to specify trams for a particular destination, you can also enter the route number. You can specify whether you want tramTRACKER® to provide low floor tram information only. tramTRACKER® information is available at major tram stops and train stations across Melbourne. Please refer to the passenger information display screens (PIDS) at stops and stations for predicted tram arrival times and disruption updates. Call 1300 MYTRAM (1300 698 726) and enter your Tracker Stop ID to find out when the next three trams are expected to arrive at your tram stop. A voice message will let you know when the next three trams are expected to arrive at your stop. Charges: 1300 MYTRAM (1300 698 726): IVR call cost $0.25/higher for STD/Mobiles.